Looking for that special vacation villa with all the ingredients for the ideal Caribbean holiday, away from it all? Then choose Villa Casona Palms. It is one of Costa Maya's most sought-after secluded luxury properties with its private beach and all rooms facing the sea. Enter the main house and step into the open great room that has all-round wooden latticed windows. You gaze immediately onto the palm beach and ocean and feel the cool breezes. Then step through double doors out onto an enormous covered terrace where you can dine or simply relax facing the ocean. Or, take a few steps to the covered BBQ area to cook the day’s catch ... and have a siesta in a hammock afterwards! The villa has been beautifully furnished and decorated, striking a wonderful balance between rustic charm and modern eco-elegance. The master bedroom and guest casita (third bedroom) have king size beds, and there are two full size beds in the second bedroom. Each bedroom has its own balcony overlooking the ocean. The villa is fully self-contained and services (cleaning, linens, bottled water, electricity, propane gas, internet, use of kayaks, etc.) are included in the rental rate. The remote property has an exceptionally wide beach front (55 metres, 183 feet), lined with mature coconut -bearing palm trees. It offers great views and seclusion. The sea in front, protected by the coral reef 500 yards offshore, is always calm, affording safe swimming for all ages. You can swim out to the reef and snorkel and, if you are into scuba-diving, there are several dive centres in the nearby village of Mahahual. Be sure to research Sargassum seaweed before planning a trip to the Caribbean. Mahahual has a number of restaurants and souvenir shops, particularly busy on cruise-ship days, after which you might want to retire to your bit of tranquil paradise. This is a complete home that can be rented either as a 2-bedroom villa for 4-6 persons (of which 2 children on convertible couches), or with an additional double-bedroom casita that can sleep 2 additional adults. Be sure to view all the photos – they’ll give you a true impression of this idyllic property. Our villa is located on a secluded part of the coast, about 35 km. (35-40 minutes drive) north of Mahahual which, in turn, is about a 4 hour drive south of Cancun. For those wanting to get out and about while at the villa - highly recommended - renting a car is best. It is a very simple drive, mainly on the excellent highway 307, through Playa del Carmen, Tulum, Felipe Carillo Puerto and Limones. Because the villa is secluded, we recommend guests to stock up on groceries on the way. The local village has a number of food & beverage shops but, as an alternative, there is an F&B concierge service available. All these are described in the Guest Book that is available at the villa and mailed to you before you leave home. What is there to do once you are at Casona Palms? - Relax, sunbathe on our private beach! - swim, snorkel or kayak in the calm sea; - eat lobsters (in season) and delicious fish caught daily by fishermen along the coast; - if you don’t feel like cooking, enjoy one of the many restaurants in Mahahual; - scuba dive with one of the centers in Mahahual (35-40 minutes away); - visit the many Mayan ruins in the area, some only 1 hour's drive away. - explore the Sian Ka'an Biosphere coast up the road. After retiring, we looked worldwide for a truly idyllic location for a second home where we could get away from the often harsh European winters. It is within easy reach of North America and Europe. We chose this spot for its beauty, seclusion, tranquillity, ideal swimming waters, year-round warm weather and friendly community. We also wanted a plot of beachfront land on which to build our dream vacation house. The natural tropical beauty and seclusion of the property, with its private beach from where to watch the sun rise over the Caribbean through the coconut palm trees, are unforgettable. It's like being on a desert island, yet only a short drive to shops and restaurants. 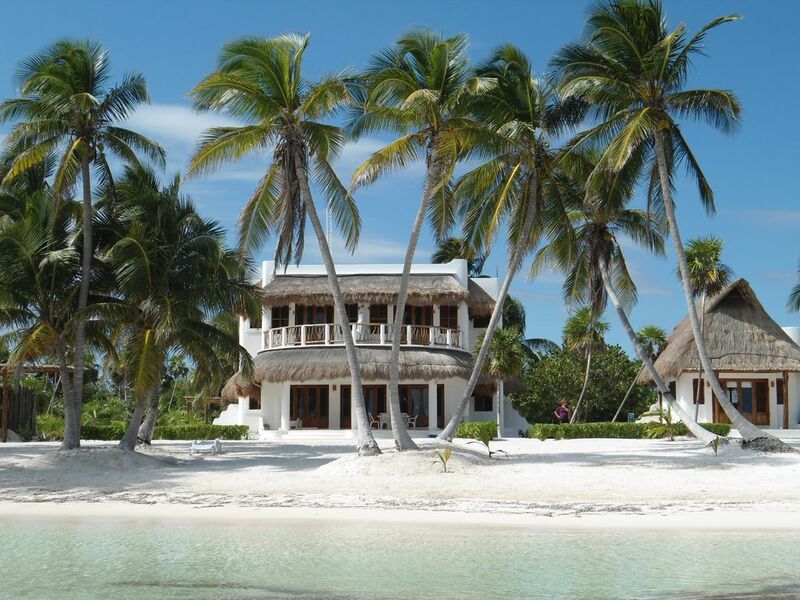 immediate access to villa's own wide private beach with beautiful mature coconut palm trees. You can make free video calls via the internet using WhatsApp or Skype. But there is no cell phone coverage in the area. In addition to bed & bath linen, a few beach towels are also available in case you have forgotten to bring your own. Washing can be done by the caretaker (surcharge payable) - no direct use of washer for the tenants. Large open plan room comprising living room and dining room, and the open plan kitchen. Round table and seating for 8 in the open-plan room. Portable speaker unit with bluetooth. Collection of novels for you to read or swap with one of yours that you have read. Also several reference books on local sea life, animals and birds. Private beach garden with palm trees and local flowering vegetation. The 2 bedroom main house can accommodate 4 adults, with 2 children on couches that convert into beds. The detached third bedroom "casita" (see rates notes) can accommodate 2 additional adults. Minimum Age Limit for Renters; On-site caretakers with own separate housing providing 24/7 security and support, 2 built-in safes, board games, books. Other Activities: Swim, snorkel, dive, fish or kayak right in front of the property - the calm sea and tide pools make it ideal for all ages. Or just relax and sunbathe on our private beach!, If you want to scuba dive, there are several centers in Mahahual (30 minutes away) where there is also deep sea and fly fishing, as well as sailing. Visit the many Mayan ruins in the area, some only 1 hour's drive away. Excellent eco-tours available. Explore the Sian Ka'an Biosphere coast up the road, ideal for bird watching and photography. Order daily-caught lobsters and delicious fish at reasonable prices from the fishermen along the coast!, For cinemas, museums, shopping malls, etc., go to Chetumal (2 hours' drive away). Attractions: Eco-tourism, Mayan ruins and Sian Kaan Biosphere. It’s a beautiful place and Michael was incredible to work with, very attentive and accommodating. My main issue with this property was it’s location and the time it took to get there from the Cancun airport. It’s an exhausting trip, even though we stayed over night in Tulum and made it an extra day of drive. I had a family emergency and had to leave after 48 hours on the property. After flights could be arranged, we were on the property for a total of 3 days. Not enough time to really sink into the experience. But the views are idyllic, the wind and seaweed unrelenting. The care takers were lovely and hard workers in daily trying to remove the accumulating seaweed from the beach. The seaweed seemed to let up a bit on the day we left. I hope so for the next family. The water shoes are a necessity as the sea floor has some sort of eco system you have to step through. It’s bumpy and rough and not a smooth sandy bottom. Maybe that clears up too. Don’t know about that. My first night there I almost hate to mention this but I’m found two scorpions, one big and one little one in the kitchen. They are very active at night there and you can see their new tracks in the sand all around the house each morning. Michael assured us they were no more dangerous than a wasp sting. All in all it was a very interesting vacation and quite an adventure, one I don’t think we’ll repeat anytime soon. I think its more for younger folks and families, not for us old farts. Three of us stayed at the lovely home of Casona Palms the last week of March, 2019. This house is truly a gem. The high ceilings and window designs help with perfect air flow and keeping the house cool. We loved the polished concrete floors and counter tops – simple, yet tasteful. The kitchen was perfect with all the cooking utensils we needed and I loved that there were 2 giant sized cutting boards available since we cooked most of our meals. We enjoyed our time in the hammocks, grilling under the palapa, relaxing on the veranda and playing bocce on the beach. We fished, snorkeled and kayaked in front of the house and took adventures north and south of the house in search of bonefish and permit. The caretakers, Israel and Rosa were very delightful and helpful and did everything with a smile. Google Translate helped us with the language barrier and we learned a lot from them. We also loved the beach dogs' company! This house was very clean and was not lacking. We loved the surrounding area and the fishing was off the charts! We are looking forward to a return trip in the near future. We really can't say enough positive things! It was better than is displayed! The house is beautifully designed to meet all of your needs. The sea is just steps away and in my opinion boasts one of the most beautiful beaches in the world. We loved the secluded nature of this home. We enjoyed the kayaks, massages (which we had on our balcony overlooking the sea! ), the hammocks and swimming everyday. Make sure to bring your snorkeling gear to enjoy that fun activity . The caretakers are super friendly and attentive--they made us feel safe and totally cared for. Michael (the owner) was very responsive to all of our questions and gave very detailed instructions on pre-arrival details. Thank you so much for a truly memorable vacation! If you're looking for a Mexican Beach house away from tourist areas and in a beautiful, natural setting with ultimate privacy, you couldn't ask for a better place than Villa Casona Palms in southern Quintano Roo. Every detail of the house is perfect and architecturally interesting, with attention to comfort and luxury throughout (we were a party of 4 adults). The sounds you hear are mostly birdsongs and breezes, the views dominated by blue skies, magnificent palms and pelicans diving for fish. Nighttime skies are brilliant with stars and moonlight. We especially enjoyed using the kayaks on site and the lounging chairs on the veranda, which is always shaded. Note that it's necessary to bring an adequate stock of groceries because Mahahual, the nearest town is about 25 minutes away. The only flaw is a problem that the whole Caribbean is experiencing: the invasion of seaweed (sargasso) along the coast. Sadly, only the big resorts have the resources to keep their beachfronts free of the stuff. So, ironically, one must trade privacy for white sand and deep water. If you're a serious swimmer, a private home on the Caribbean may not be ideal. But if you're looking for a beautiful home in a remote location with lots of privacy, we believe you can't do better than Villa Casona Palms. Our villa is located on a secluded part of the coast, about 35 km. (35-40 minutes drive) north of Mahahual which, in turn, is about a 4 hour drive south of Cancun. For those wanting to get out and about while at the villa - highly recommended - renting a car is best. It is a very simple drive, mainly on the excellent highway 307, through Playa del Carmen, Tulum, Felipe Carillo Puerto and Limones. But do you prefer not to drive? There is a Cancun Airport to Mahahual valet service for groups of up to 8 passengers, with stops on the way for a meal and shopping and combined with taxi support at the villa. Ask us for more information. Because the villa is secluded, we recommend guests to stock up on groceries on the way. The local village has a number of food & beverage shops but, as an alternative, there is an F&B concierge service available. All these are described in the Guest Book that is available at the villa and mailed to you before you leave home. The Unique Benefits at this Villa:Our villa combines the style of white Mediterranean villas with Mayan touches (see photos). From the villa, you walk straight to your private beach and the warm waters of the Caribbean! All rooms face the Caribbean Sea, enjoy marvellous views, are very light and have the sea breeze constantly flowing through wooden louvered shutters and doors. The villa is spacious (4000 sq. ft.) yet easy to keep clean! Whilst the interior is delightful, you will find yourself constantly enjoying the unique outdoor features of the property and exploring the near deserted coastline. Be sure to view all the photos – they’ll give you a true impression of this idyllic property. More Leisure Activities: Boating, Kayaking, Surfing.